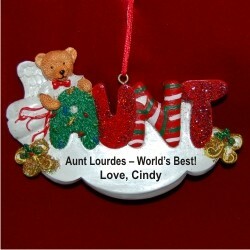 Aunt ornaments by Russell Rhodes make the ideal personalized Christmas ornament gift. 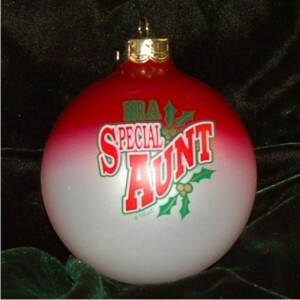 We offer Aunt ornament styles for every taste. Consider resin, polymer clay or glass ball Aunt Christmas ornaments to tell your favorite Aunt how much she's appreciated and loved. You can personalize any of these ornaments with her name and the year. To create an extra special and meaningful gift, add your own loving heartfelt sentiment to tell her what she means to you. You can also create a best Aunt ornament for the Aunt that's made herself a real part of your life, the kind that is part Aunt and part truly special friend who really cares, writes your notes and emails, or attends recitals and sports events that you participate in. Each of our ornaments can be made into an Aunts first Christmas ornament, a great Aunt ornament, or world's best Aunt Christmas ornaments to say what you really intend to share with her. The glass balls arrive in their own box, and our other ornaments for Aunt and Auntie arrive as indicated in our classic black velvet pouch, ready to make a truly personal and special gift.